You can still place your Avon Campaign 26 backorder until Wednesday, December 4th, 2013. Browse the brochures below, pick the items you wish to order (by item number) and Click Here! to enter your order. The order form will open in a new window so you can refer back to the brochure. You will have to select which campaign the item number is from to get the correct price. Thank you for shopping my Avon website. 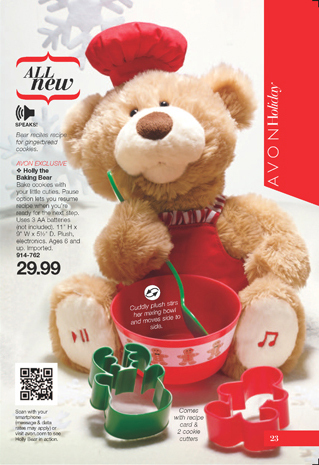 Avon Campaign 26 Brochure is still available for online ordering. Buy Avon Online from the comfort of your own home and have it delivered straight to your door. CLICK HERE! to shop my Avon website and buy Avon online. You can backorder from Avon Campaign 26 Brochure until Wednesday, December 4th, 2013. Don’t forget to use Avon Coupon Code FS30REP to get FREE SHIPPING on any order over $30. This offer applies to Direct Delivery orders only. Visit my Avon website at shop.avon.com and sign up for our Avon newsletter. Receive special FREE SHIPPING offers and discount special straight to your Inbox. Bake cookies with your little cuties. Pause option lets you resume the recipe when you’re ready for the next step. Cuddly plush stirs her mixing bowl and moves from side to side as she recites the recipe for gingerbread cookies. Only $29.99. Browse the catalog here or you can buy this precious Christmas bear online. As dramatic as a peacock’s feather. As sparkling as a mermaid’s tail. Our Rhinestone Ombré Mesh COllection is a gift guaranteed to turn heads. Only $9.99 each or choose ANY 2 on pages 116 and 117 for $15.00. Click Here! to buy online through the brochure, or you can go directly to the Rhinestone Ombré Mesh Collection here. No reason you can’t be comfortable while you glam it up. The perfect length, a flattering neckline and dazzling details make the Metallic Studded Tunic this holiday’s “it” sweater. Soft and comfy, this sweater is casual enough to go with anything! The studded details make it special. Figure flattering below-the-hip length. Cotton/polyester. Hand wash/dry flat. Imported. Click Here! to browse the brochure or Click Here! to buy it directly online. Experience the allure, the power and the glamour of our richest, most luxurious perfume ever. Passion makes an exquisite gift that you’ll want to keep for yourself. Rich in precious ingredients, in a jewel of a bottle. Express you inner passion with this bold statement of sparkling star fruit, sensual jasmine and alluring vanilla bourbon and creamy musk. 1.7 fl oz. Get a FREE BODY LOTION with each purchase of the Eau de Parfum Spray. That’s a $12.00 value! Click Here to buy Avon’s Exquisite Passion fragrance online now!